Figure 1. 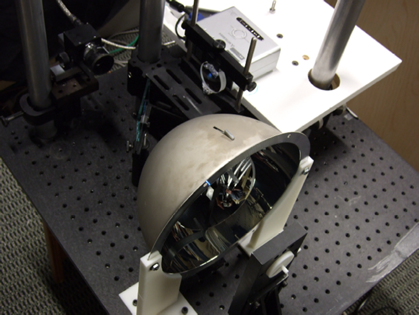 Left: Photograph of the proposed BRDF acquisition setup including a camera, a projector, a beam-splitter, and two curved reflectors mounted on a 40 cm × 40 cm optical bench. Right: Various BRDFs acquired with our prototype setup using orthonormal zonal basis functions. or by fitting analytical reflection models to the data. 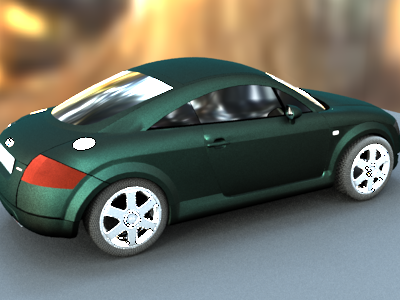 For specular materials, we experiment with alternative basis acquisition approaches such as measuring the response to basis defined by an anlytical model as a way of optically fitting the BRDF to such a representation. We verify this approach with a compact optical setup that requires no moving parts and only a small number of image measurements. 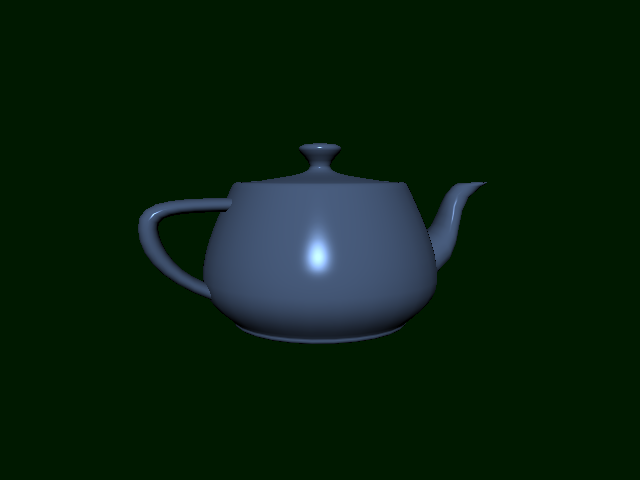 Using this approach, a BRDF can be measured in just a few minutes. process that we used for our prototype system allowed us to produce a section of that range corresponding to 51% of the hemisphere. Figure 2. Left: Physical setup of our reflectance acquisition device. Right: A prototype demonstrating the concept in 2-D. Figure 2 shows a diagram and a 2D mockup of such an optical setup. A camera focused on the mirrored components can capture the full zone of reflected directions in our setup. Simultaneously, a projector focused on the the mirrored components can cover the corresponding zone of incident directions. 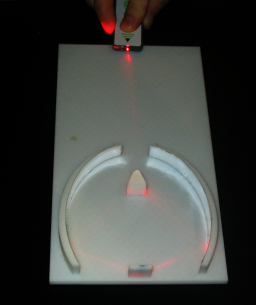 In the 2D prototype on the right, we focus illumination on the mirrored components using a laser pointer and observe that the beam bounces back to its origin, validating the concept. Figure 3. 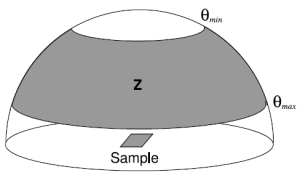 The measurement zone Z. In this work, we define a set of suitable orthonormal basis function over the measurement zone Z using Associated Legendre Polynomial (ALPs). For practical applications, we of course need to extrapolate from the data measured over the zone to incident and exitant directions that have not been measured. This task is simplified by the global support of our basis functions, and would be much more difficult for a basis with local support, such as a Wavelet basis. In general, we would also like to transform the data into a different representation that is more convenient for rendering purposes. We choose the tensor product Spherical Harmonics (SH) basis for representing low frequency BRDFs. The transformation to SH involves a sparse linear system, and is hence very efficient. For specular materials, it is well known that basis functions such as spherical harmonics or our zonal basis suffer from oscillations in the proximity of discontinuities or strong gradients. These oscillations are visible in the reconstruction as undesirable ringing artifacts also known as the Gibbs phenomenon (Figure 4, center). Figure 4. Left: original acrylic blue paint BRDF acquired by Matusik. Center: 10th order zonal reconstruction, rendered after transformation into SH. Right: Corresponding D-BRDF fit to the zonal reconstruction. Instead, we propose to fit the higher order zonal representation of specular BRDFs to an analytical model, thereby computing a least-squares fit over the spurious oscillations. In our experiments, we worked with the distribution based BRDF model by Ashikhmin due to the simplicity of the fitting procedure. However, the measured zonal data can be fitted to any other suitable analytic model using a numerical procedure such as Levenberg-Marquardt. providing a function that is proportional to the distribution p(h). Here c is a normalization constant and r0 is the reflectance at normal incidence. 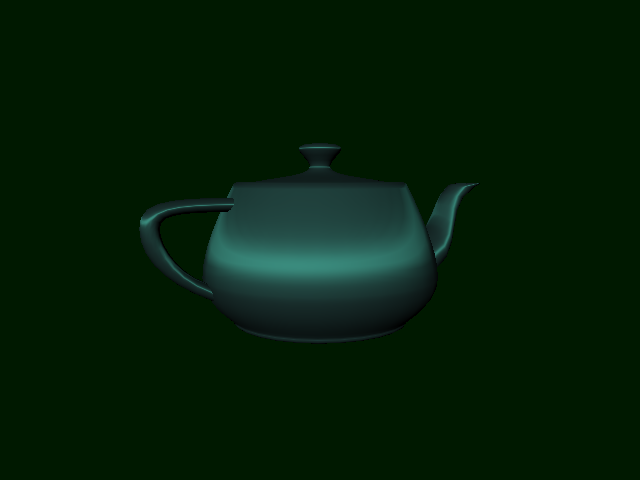 We propose to model the BRDF with the usual diffuse + specular separation. Then the measurement process just involves obtaining estimates of the diffuse and specular reflectance coefficients kd and ks respectively with a basis of chosen distribution p(h) for a given material. Appropriate distributions p(h) for many commonly found materials have been well documented in the literature. For example, Ngan et al. have published cosine lobe and microfacet distribution fits to the 100 measured isotropic materials in the MERL database, while distributions for fabrics such as velvet and satin and general anisotropic Gaussian distributions for materials like brushed metal has been studied by Ashikhmin. Using our prototype setup, we have acquired the BRDFs of various types of materials, including velvet, anisotropic synthetic, silk and satin fabrics, leather, various kinds of glossy and shiny papers, paint and plastic samples, printer toners, wax, highly specular metal foil wrapping papers, and anisotropic samples such as a guitar pick and a copper coin. Figure 1 presents a selection of BRDFs acquired with the orthonormal zonal basis functions, as rendered on a sphere under a directional light source. Most of the materials were acquired using lower order (l <= 6) zonal basis functions. The silk and satin fabrics, and the guitar pick were acquired with order l = 8 zonal basis function, while the shiny wrapping papers and anisotropic copper coin required acquisition with order l = 10 zonal basis function. The total number of images acquired for an order l acquisition is (l+1)2×2×3, with 2 separate positive and negative parts, and 3 exposures for HDR imaging. The entire acquisition process takes just a few minutes to complete even for higher order zonal basis functions. Figure 5. 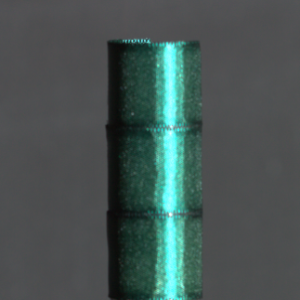 Left: Metallic teal automotive paint. 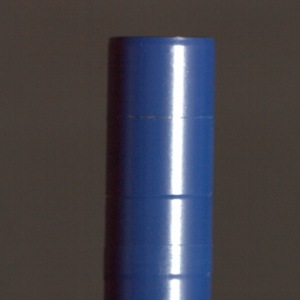 Right: Krylon true blue paint. Figure 6. Left: Red KitKat wrapping paper. Right: Copper colored Lindt chocolate wrapping paper. 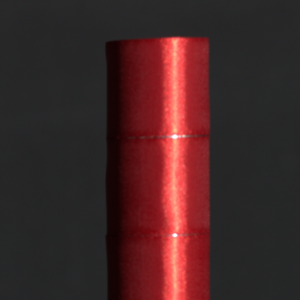 Figure 6 demonstrates the specular materials, in this case shiny metal foil chocolate wrapping papers, that we acquired using higher order zonal basis functions and then fit to the D-BRDF analytical model. Figure 7. Top row: Red satin. Bottom row: Blue satin. Left column: Real photographs. Right column: Renderings of D-BRDF fits. 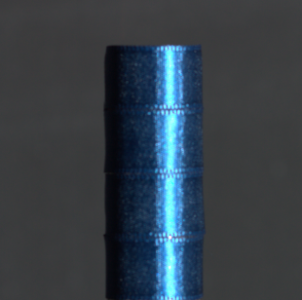 In order to validate our measurement and fitting approach for high frequency BRDFs, we photographed two satin samples wrapped around a cylinder in a dark room and lit by a collimated point light source. Figure 7 presents the comparisons of these photographs with the corresponding renderings of the D-BRDF fits to these samples. 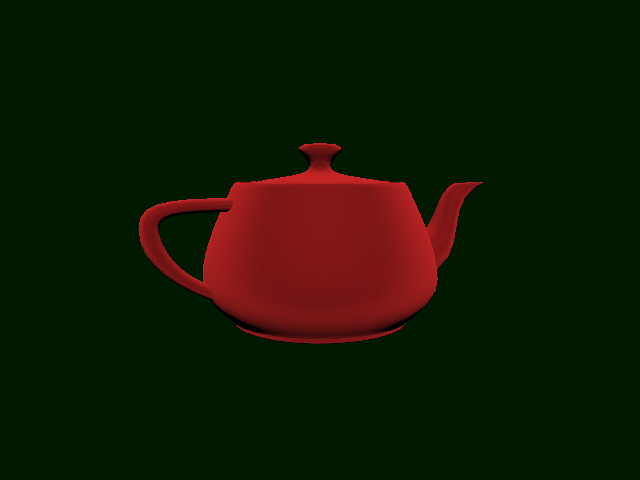 The highlights in the rendered images (right column) are a close match to the real photographs (left column). Figure 8. Specular materials acquired using data-dependent basis functions based on the D-BRDF analytic model. From left to right: red wax, blue electrical tape, red velvet, green satin. Figure 8 presents results of our measurements with data-dependent basis functions based on the D-BRDF analytic model. 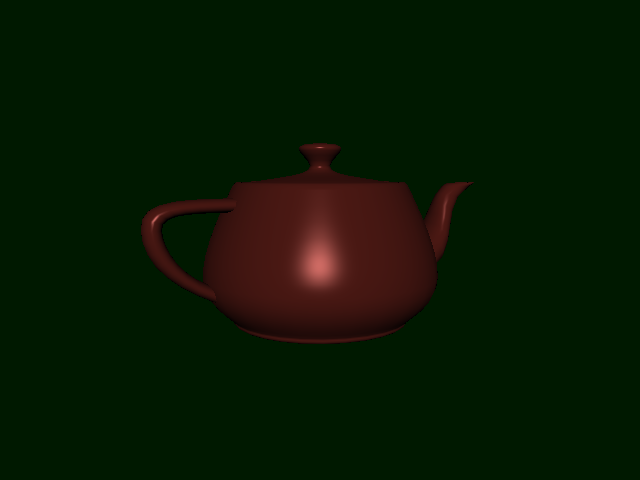 Here, we approximated the diffuse component of the BRDF by averaging the response to the constant basis 1/Pi . The specular component of the BRDF was estimated from an average of 24 back-scattering measurements uniformly distributed over the measurement zone in response to a basis illumination constructed from an appropriate distribution p(h). Figure 9. Top row: Blue electrical tape. Bottom row: Green satin. Left column: Real photographs. Right column: Renderings of D-BRDF fits. Figure 9 presents the comparisons of photographs of the blue tape and green satin samples with the corresponding renderings of the D-BRDF fits to these samples using such data dependent basis functions. 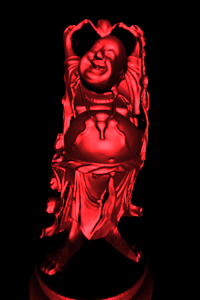 The highlights in the rendered images are visually a close match to the real photographs, validating out approach. 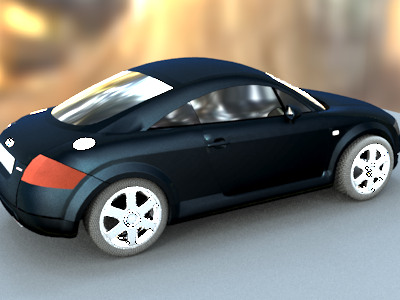 We were able to obtain very good estimates for the parameters of the BRDF model with very few images with this approach compared to what would be required for similar materials with a higher order zonal basis acquisition. percentage of the hemisphere to obtain high quality BRDF measurements with our basis function approach. 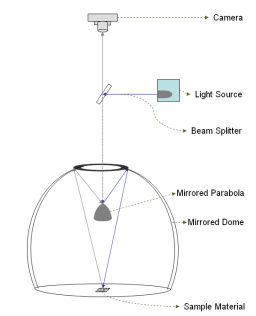 To further increase quality by reducing the amount of extrapolation, a dome with a larger coverage could be used. In conclusion, due to the basis function illumination and dispensing of all moving parts, BRDF measurement with our approach is very fast, reducing the acquisition time to a few minutes even for high-frequency materials. Moreover, the physical dimensions of the setup are quite compact, so that the whole apparatus could be enclosed in a small box for mobile on-site acquisitions for vision and graphics applications. A. Ghosh and W. Heidrich: The D-BRDF Model as a Basis for BRDF Acquisition, ACM SIGGRAPH 2007 poster.